"Thorne" redirects here. For other uses, see Thorne (disambiguation). "I enlisted with the Spartans because I was in the Army a year before my family and friends were killed in New Phoenix. I always thought the Spartans were special. Maybe I could have saved them." Gabriel Thorne (service number 83920-91083-GT) is a SPARTAN-IV supersoldier and a member of the UNSC Infinity's Spartan contingent. In early 2558, Thorne was assigned as the newest member of Fireteam Majestic, the team being deployed aboard UNSC Infinity in February. The next month he was given command of Majestic. A younger Gabriel Thorne playing a violin. Thorne's earliest known engagement occurred on Criterion, where he single-handedly saved his entire platoon. He later fought on Tribute and Reach during the Covenant's invasion of the Epsilon Eridani system. A few months later he served under Colonel James Ackerson during the Battle of Mare Erythraeum on Mars. In 2553, his grandfather died and he was present in his funeral; it was the last time he saw his grandmother and visited New Phoenix. 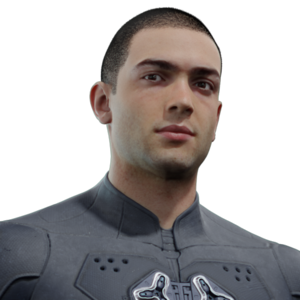 Thorne's courage and tactical awareness allowed him placement into the SPARTAN-IV program in mid-2557. He was away on a recruitment deployment when the Didact's attack on New Phoenix killed his family and friends. Spartan Thorne was assigned to Fireteam Majestic in early 2558. Fireteam Majestic was deployed to the UNSC's flagship, Infinity, in February 2558. Sometime later, Fireteams Crimson and Majestic were sent north of the UNSC's area of operations in Requiem in order to shut down Forerunner power generators. Upon reaching their location, both Crimson and Majestic had their long-range communications jammed by Forerunner jamming devices. When DeMarco questioned why Infinity command could not hear him, Thorne joked they were probably ignoring him. After deactivating the jammers, their mission continued. Initiated by Commander Sarah Palmer, the mission became a competition for the fireteams to see who could complete their mission objectives first. Majestic took the lead at first, but were ultimately bested by Crimson. Sometime later, Fireteam Majestic was being engaged by multiple Promethean Crawlers. Anthony Madsen started complaining about the Prometheans' ability to "pop up" anywhere, when a Promethean Knight translocated into the area and shot Madsen in the shoulder. Several others then translocated in the area and engaged Majestic. They survived the fight and were extracted back to Infinity. Thorne later volunteered to guard Doctor Catherine Halsey while she worked on the Forerunner artifact recovered by Crimson. He questioned her about the use of children for the SPARTAN-II program. He also asked if she thought the current generation of Spartans were capable of being true Spartans. He later told her why he joined the SPARTAN-IVs, expressing his guilt that he was not able to do anything to save his family and friends during the New Phoenix incident. When asked about the Prometheans, he told Dr. Halsey they were nothing but trouble. Thorne is surrounded by Covenant forces. Sometime during the operation in recovering the "Didact's Gift" from Galileo Base, Majestic was pinned down due to Covenant air support. With the base air defenses offline, Thorne quickly hijacked a low-flying Type-26 Banshee and destroyed a nearby Type-44 Phantom dropship, allowing the Fireteam to return to the Infinity. As the device was being examined by Dr. Halsey and Roland, the matrix gave off an energy burst, it sent images of New Phoenix throughout the monitors within the room, which Thorne quickly recognized. He noticed that the translocation artifact appeared in one of the images; curious, he left the laboratory and later approached the artifact. Wondering how the artifact could have been present at New Phoenix prior to its discovery, Thorne touched it and was unexpectedly translocated to a Forerunner structure in the Cauldron, where he was immediately surrounded by Sangheili Storm forces. Thorne put up a fight, managing to kill most of the Sangheili before being knocked unconscious. Coming to, he pretended to stay unconscious as the Covenant forces led him to their base. After arriving, Dr. Henry Glassman—who had escaped at the time—arrived at the front entrance. Thorne chose then to get up and kill his two Sangheili captors. When Gek 'Lhar remotely activated Glassman's plasma charge-rigged vest, Thorne quickly disposed of it and the two fled. Gek quickly picked up their trail and pursued them. Some time later, Gek ambushed the pair as they were resting. Thorne quickly disarmed Gek of his Type-1 energy sword and engaged him in a close-quarters brawl. Gek, however, managed to gain the upper hand from Thorne after smashing a large rock over his chest and head. Just before Gek could kill Thorne, the rest of Fireteam Majestic arrived. DeMarco shot the Elite dead, saving Thorne's life. Afterwards, Thorne searched the dead Sangheili for anything significant, giving DeMarco the energy sword in gratitude, as well as Gek's personal collection of UNSC dog tags. Thorne also took Gek's personal Type-3 active camouflage module for himself, while Madsen only found a map of Requiem. Later, with Thorne's help, Glassman had Crimson head to certain locations to ensure the map was accurate. Thorne with one half of the Janus Key. As a Pelican landed to bring Glassman back to Infinity, Captain Lasky contacted Majestic via hologram, ordering them to rescue Halsey, who had been taken by the Covenant and had a kill order placed on her by CINCONI, Admiral Serin Osman. Returning to the Librarian's shrine, Thorne got the guards' attention, before Majestic opened fire from the high ground. DeMarco ordered Thorne to proceed inside and rescue Halsey. He caught Jul 'Mdama off guard and killed two of his bodyguards. As Jul grabbed Halsey, she passed him one half of the Janus Key given to her by the Librarian. As Palmer turned up, Jul summoned Promethean Knights to cover his escape. By the time the Spartans managed to destroy the Knights, Jul teleported away, with Halsey in tow. After yelling in frustration, Palmer demanded to know why Majestic was there. DeMarco explained that they were on a rescue mission, to which Palmer retorted that Halsey was a traitor. Thorne did not believe so, and showed the Commander that Halsey had given him one half of the Key. After Jul 'Mdama set Requiem to a self-destruct trajectory with its sun, Thorne and the rest of Majestic were dispatched to deactivate one of the artifacts keeping Infinity locked in the shield world's orbit. Though they faced heavy resistance, the Spartans were successful in their mission and were evacuated on Infinity via a Pelican dropship at the last moment before Requiem collided with the star. Thorne leading Majestic aboard the Pilgrims Pride. Madsen: "Hey Thorne, you hear that? Everything's going to be fine! Spartans are inbound!" Thorne: "Hopefully that impresses whoever's trying to blow us up." Sometime after the Requiem Campaign, Palmer transferred DeMarco to Fireteam Bailey and put Thorne in command of Fireteam Majestic, which led to the death of DeMarco in the Battle of Ealen IV. In March 11, 2558, six days after DeMarco's death, Thorne and the rest of Fireteam Majestic were deployed along Fireteams Colossus and Fenrir to repel an attack to the Infinity and prevent the freighter Pilgrims Pride from self-destructing on the ship. Leading the fireteams, Thorne ordered teams Colossus and Fenrir to secure the ship while Majestic made their way to the core. As the Spartans advance through the freighter, they encountered automated defense turrets. With the enemy going into retreat, the freighter was tugged out into space, where Grant ejected the ship's core before it exploded. The Spartans survived the detonation and requested extraction. Following the attack, Infinity learned that the assault crafts from the freighter belonged to the long-lost UNSC Spirit of Fire. Roland discovered that the freighter was launched near Oth Lodon, a gas giant located deep in Jiralhanae space. With the Spirit's possible location found, Lord Hood authorized Commander Palmer to conduct a search and rescue mission. Equipped with OF92 Booster Frames, Fireteam Majestic and Palmer scouted the planet's system. During the expedition, Thorne asked Madsen to restrain himself from pushing the limits of his booster frame. Madsen retorted that Palmer was in command, at which point Palmer told him to listen to Thorne as leader of Majestic. Exploring the system's asteroid field, the Spartans came across not the Spirit of Fire but instead a Covenant station under control by New Colonial Alliance insurgents. The NCA station disabled Infinity using its powerful energy projector, prompting Commander Palmer to lead Majestic in an effort to take control of the station. After evading oncoming missiles, the Spartans quickly boarded the station and secured the bridge, ordering everyone to freeze. Clayton told his crew not to listen and asked the Spartans if they knew who he was. Madsen responded saying he knew who he was and knocked Clayton down for being responsible for DeMarco's death. The Spartans then turned their attention to Shipmaster Vata 'Gajat, who was preparing to assault the crippled Infinity. With the station's cannon back online, they fired on 'Gajat's flagship, destroying it and saving Infinity. "Those dreams of yours are trying to tell you something. They're telling you there's pain that you need to let out." — Tedra Grant comforting Thorne. Thorne and Grant in New Phoenix. By March 22, Fireteam Majestic was stationed aboard the orbital defense platform Oaxaca Station over Earth while Infinity underwent repairs. Aboard the station, Thorne was having problems sleeping due to nightmares about the attack on New Phoenix eight months ago and the death of his grandmother. He was awoken by Grant—who was unable to fall asleep herself, as she does not feel at home—and the two discussed attending the reopening of New Phoenix. Thorne was at first reluctant to return to the city. However, Grant insisted that he visit his home and offered to accompany him as "backup", seeing as they had nothing to do for the next three weeks. Two days later, on March 24, 2558, they attended New Phoenix's Rebirth ceremony presided by UEG President Ruth Charet. Thorne then took Grant to his family's home and showed her around. While exploring the house, Thorne discovered a violin belonging to his grandmother in the backyard of her house. He concluded that his grandmother had been practicing it when the attack occurred. Distraught, Thorne decided he wanted to leave but Grant told him the story of how she was on her home planet when it fell. Grant told Thorne that he should be happy to still have a home to return to and that his dreams were trying to tell him to relieve all the pain he had inside. Grant then left Thorne as he decided to honor his family by playing Mozart on his grandmother's violin. Three weeks later, they returned to Infinity and departed from Earth. His brief visit to New Phoenix eased his psyche, freeing him from the nightmares about the attack that had plagued him for months. Thorne and Ray preparing for their mission. On May 9, 2558, Thorne and Spartan Naiya Ray were hand-picked by Captain Thomas Lasky for a classified mission to capture and interrogate a Sangheili in possession of a new bioweapon on the desolate planet of Ven III. After making landfall, the Spartans encountered several disorganized Kig-Yar before passing into a communications jamming field. The duo discovered a Covenant structure where they were ambushed by the target Sangheili and a group of Kig-Yar. In the ensuing skirmish, the Sangheili managed to incapacitate Thorne with a shock device he affixed on the Spartan's armor and captured him. Thorne was taken into a subterranean Kig-Yar pirate stronghold by the Sangheili agent on a Type-32 Ghost; Ray pursued Thorne's captor into the hideout where she witnessed the Sangheili and a Kig-Yar carrying him into a hangar bay. Thorne was eventually found by Ray, who managed to disable the device holding him in place and held back the Sangheili agent and his allies. However, the agent managed to escape. Ray told Thorne she was going to stay behind until rescue arrived. However Thorne ordered Ray to pursue the Sangheili instead due to mission priorities. Thorne was eventually rescued by Fireteam Majestic thanks to the efforts of Ray and returned to the Infinity. He was placed in recovery with Ray residing by his bedside. Palmer tends to Thorne during the Battle of Oban. In July 16, 2558, the human colony of Oban was attacked by Jul 'Mdama's forces and his Promethean allies. During the battle Thorne was ambushed by a Promethean Knight but he was saved by Commander Palmer. With the Prometheans' presence, Palmer ordered all UNSC forces to search and find Jul 'Mdama. After Joel Thomas ordered an airstrike on two Type-44 Phantoms near Palmer's position, Palmer ordered Thorne to get to an M12 Warthog LRV and pursue the Phantoms, but they were ambushed and pursued by Promethean Crawlers. They dispatched several of the Crawlers and Palmer jumped out of a cliff, directly above the Phantoms. The Warthog landed on the ground, injuring Thorne, and the Phantoms prepared to shoot their heavy plasma cannons at them. However, a GA-TL1 Longsword appeared, destroying both Phantoms, and saving Palmer's and Thorne's lives. Thorne returned to Infinity after the UNSC won the battle. After Infinity was stranded in an uncharted system, Thorne and Fireteam Majestic, led by Commander Palmer, were deployed to the planet Aktis IV to investigate a mysterious signal. After eliminating a small group of Covenant forces, they discovered a Forerunner structure and provided protection for Dr. Glassman as he arrived to investigate the site. Several hours later, Thorne was charged by Palmer with transporting the science equipment from an incoming Pelican to the Forerunner structure. However, the Pelican was shot down by Sali 'Nyon's forces, triggering a massive Covenant ambush which soon forced Thorne and the other Spartans to retreat into the Forerunner facility. Palmer, Thorne and Ray observing the battlefield on Aktis IV. The Spartans and Dr. Glassman remained barricaded in the structure for over seven hours. After Glassman was able to activate the facility's teleportation grid, Palmer took Thorne and Ray with her on her personal mission to hunt down Dr. Halsey, who had been spotted in the jungle, while the rest of the Spartans teleported to a different destination. After taking the portal into the jungle Thorne, Ray and Palmer spotted a Sangheili Minor who had defected from Sali 'Nyon's Covenant. The Minor contacted 'Mdama's forces and offered them the Janus Key half stolen by 'Nyon. Thorne and Ray prepared to ambush the Minor but Palmer ordered them to stop. Both Spartans questioned her order, pointing out that they could easily take the Janus Key from the Sangheili before Halsey arrived with a greater force. However, Palmer intended to wait for Halsey instead in order to ambush her. A convoy of Phantoms and Wraiths escorting Halsey to the Minor's location soon arrived. The Sangheili Minor gave Halsey his half of the Janus Key, and all vehicles—except for a Phantom and Wraith—were recalled to different parts of the island. As Halsey and the remaining Covenant soldiers prepared to depart for Song of Retribution, the Spartans ambushed them. While the Thorne and Ray battled the Sangheili Zealots guarding the Phantom, Halsey was escorted into the forest by a lone Zealot. Palmer ordered Thorne and Ray to finish off the remaining Zealots, while she pursued Halsey and her guard. Palmer ultimately failed, and Halsey and Jul's Covenant fled the planet with both halves of the Janus Key. After all UNSC forces on Aktis IV returned to Infinity, Thorne and Ray were furious about Palmer's behavior on the planet, a fact that Lasky brought to Palmer's attention. "Never been a big believer in destiny myself... But it looks like you two were just meant to be together"
Thorne sneaks behind two Kig-Yar. 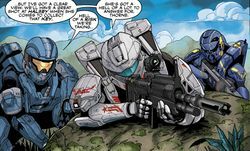 Soon after Thorne was chosen to take part in Operation: Athena alongside Commander Sarah Palmer, Holly Tanaka, Dr. Henry Glassman and Ayit 'Sevi, the same Sangheili he had already encountered during the mission on Ven III. The military operation was designed by Admiral Serin Osman to prevent Jul 'Mdama and Dr. Catherine Halsey from accessing the Forerunner facility known as the Absolute Record. On September 15, Thorne and the rest of the team were briefed on how they would infiltrate Jul 'Mdama's fleet by stowing away on-board the assault carrier Breath of Annihilation. Upon arrival at the Absolute Record, the team would separate from the fleet and use an advanced telemetry probe to transmit their location back to the UNSC for reinforcements. Two days later on September 17, Ayit 'Sevi rendezvoused with Jul's fleet in the Urs–Fied–Joori system and sneaked Thorne and the other members inside the Breath of Annihilation. After the fleet jumped in and out of slipspace and neared the portal to the Absolute Record, multiple slipspace ruptures materialized into several ships of the fleet, one of which began to tear apart Annihilation. 'Sevi informed the team they had to abandon the ship and that their probe had been destroyed. The team was forced to flee and fight their way through a Covenant battalion in order to reach an undamaged hangar bay. Ayit 'Sevi soon procured a Phantom and transported everyone directly to Jul 'Mdama's flagship, the Song of Retribution. With news that 'Mdama would push forward to the portal and reach the Absolute Record, the team resolved to split-up. Thorne and 'Sevi returned to Annihilation in an attempt to use its communications to contact ONI, while Tanaka and Palmer and a conscious Glassman remained aboard the Song. Thorne was hidden while the Annihilation descended to a nearby moon for repairs, but rumors had spread about a Spartan team possibly being aboard the Covenant's ship. Deciding to take advantage of the brewing arguing in the ship, Ayit had Thorne leave their Phantom and cause panic throughout the Annihilation. With Ayit helping Thorne through radio to remain one step ahead of his pursuers, Thorne led the Covenant in a chase and eventually fled the ship into the neighboring swamp. Thorne continued to evade his opponents, but was badly wounded by a Jackal's Needler then nearly drowned. Too injured to remain running, Thorne took a spare Banshee to fly back to the carrier. Ayit headed to the hangar to find and hide him upon landing, but was intercepted by two Zealots who had overheard him talking to Thorne. But before they could kill him, Thorne inadvertently saved Ayit's life by running over both Elites with his Banshee. Thorne then hid in Ayit's Phantom again until the Annihilation returned to Sangheili space, where he and his team left the ship and boarded an arriving ONI prowler to take them home. On October 17, 2558, Thorne and Grant were assigned to aid a new Spartan recruit assigned to the UNSC Infinity. Thorne and Grant annotated the Spartan's official field manual with additional notes, some of them including information on classified topics such as the Ur-Didact. Thorne was selected into the SPARTAN-IV program on the basis of his courage and tactical acumen. Even before becoming a Spartan, Thorne had a strong sense of responsibility; he believed he could have somehow prevented the deaths of his loved ones in New Phoenix if given the chance. After his re-enlistment, Thorne was determined to make sure that there would be history for the SPARTAN programs, as proven in a journal entry he had written and his curiosity of the original Spartans. Though Doctor Catherine Halsey is mostly dismissive of the SPARTAN-IVs (regarding them as inferior to her SPARTAN-IIs), she appeared to regard Thorne as embodying to the ideals of the original program more than his peers during their brief interaction. In combat, Thorne has shown creativity and innovation. For example, he hijacked a Type-26 Banshee during the Requiem campaign—despite fireteam leader Paul DeMarco's orders—to help eliminate surrounding Covenant forces. Later in the campaign, used Doctor Henry Glassman's explosive vest to kill a group of charging Sangheili Storm when Thorne realized the vest was about to explode. Thorne is also very skilled in combat. He was able to defeat several Sangheili warriors after he was teleported to the Cauldron despite being unarmed, before being knocked unconscious. During his encounter with Gek 'Lhar, he was temporarily able to hold his own against the assassin despite being ambushed and Sangheili's strength. Thorne was close with his family and felt guilty that he was unable to prevent any of their deaths. When he discovered that the Prometheans that he was battling on Requiem contained the essences of those composed in New Phoenix, he stormed out of the room in anger. Thorne is close friends with fellow fireteam member Tedra Grant and the two are comfortable confiding in each other. She accompanied him to New Phoenix's Rebirth ceremony and encouraged him to honor his family in memory, instead of feeling responsible for their deaths. Thorne also formed a bond of sorts with DeMarco after the latter killed Gek. Prior to the event, the two rarely spoke and Thorne seemed to hold little respect for DeMarco's leadership capabilities. After Thorne became the commander of Fireteam Majestic, Anthony Madsen was disrespectful of Thorne to some extent, likely grieving over DeMarco's recent death. Although he initially lashed out on Thorne during a training exercise in a fit of rage over DeMarco's death, Madsen seemingly came to respect Thorne's leadership abilities. Madsen did later invite Thorne to a poker game in competition to win Gek 'Lhar's energy sword that DeMarco had taken from him on Requiem. Thorne has also developed a friendship with Spartan Naiya Ray. Thorne wears the Recruit variant of the MJOLNIR GEN2 armor with Ricochet forearms, equipped with VISR 4.09. His armor is painted blue like the rest of Majestic. He generally uses an MA5D assault rifle in combat. After Paul DeMarco killed Gek 'Lhar, Thorne took the Elite's Type-3 active camouflage module. Thorne is voiced by and modeled after Ethan Peck, a grandson of the famous actor Gregory Peck. Some of Thorne's effects, including his Infinity Briefing Packet, a War Games scoresheet, his MJOLNIR requisition sheet, and a classified message, are included with the Halo 4 Limited Edition. Thorne was to be a member of Fireteam Osiris at an early point in the development of Halo 5: Guardians, although he was supplanted by Edward Buck later on due to actor Ethan Peck having scheduling conflicts with another television show. Thorne is still shown alongside the members of Osiris in a piece of artwork featured as the cover of The Art of Halo 5: Guardians. Madsen and Thorne in their GEN2 armor. Thorne with Hoya, just before the latter breaks cover. Thorne after hearing Halsey's opinion of the SPARTAN-IVs. Thorne is pulled through the artifact's portal. Thorne engages several Elites in an attempt to defend himself. Thorne is subdued by Sangheili warriors. Thorne's Broadsword being pursued by a Vulture on the cover of Halo: Escalation #4. 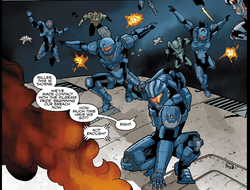 Thorne's Booster Frame pursuing a Sangheili Ranger on the cover of Halo: Escalation #5. Thorne and the rest of Fireteam Majestic on the cover of Halo: Escalation #7. Thorne's nightmare about the New Phoenix Incident. Thorne attacking a Kig-Yar Storm with his combat knife on the cover of Halo: Escalation #11. Thorne using his thrusters to attack Kig-Yar. Thorne is rescued by Ray. Gabriel recovering with Naiya by his side. Thorne during the Battle of Oban. Thorne and Ray during the Battle of Aktis IV. 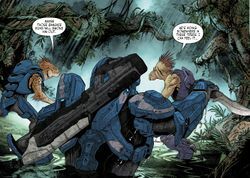 Thorne being choked by Ayit 'Sevi on the cover of Halo: Escalation #19. Thorne attacking a Kig-Yar Storm with his combat knife on the cover of Halo: Escalation #22. Early concept art of Fireteam Osiris for Halo 5: Guardians with Gabriel Thorne instead of Edward Buck. 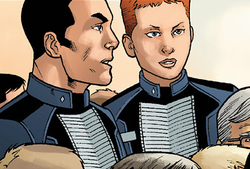 ↑ Thorne's 18th birthday (and thus his earliest opportunity for independent enlistment) occurred on July 5, 2552, 18 days before the Covenant's initial reconnaissance of Reach. However, this would leave inadequate time for basic training, which generally lasts around two months; moreover, the Battle of Criterion occurred at some point before the invasion of Epsilon Eridani. It is thus likely that Thorne enlisted with his grandparents' consent while he was still a minor.